Saatchi Art’s curators have worked with artists from around the world to hand-pick every artwork we offer on Limited in order to provide you with an unmatched selection of limited edition prints. 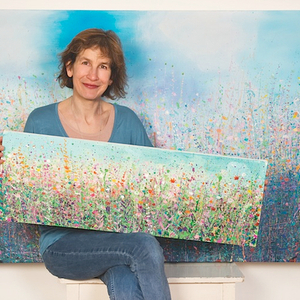 We are proud to offer "Summer Colour" by Sandy Dooley, which is available exclusively on Limited. Artworks in a limited edition have a set number of prints available for each size offered. For the 10x10 size edition, "Summer Colour" comes in a limited edition of only 100 prints. Once all 100 of the prints in this edition size have sold out, there will be no other prints of "Summer Colour" available in the size of 10 inches high by 10 inches wide. Limited edition prints of this artwork may be available in other sizes. My poem to warm, and warmly coloured August! This painting is full of warm tones, yellows, pinks, oranges and reds, as well as blue skies. I use acrylic paints, employ washes and large brushstrokes on the canvas before flicking, dripping and using palette knives to create a vibrant and interesting surface. This 60x60cm canvas is unframed. It has white painted edges and is strung with picture cord ready to hang.